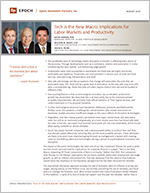 Tech is the New Macro - Part II: Implications for Labor Markets and Productivity - Epoch Investment Partners, Inc. The accelerated pace of technology means disruptive innovation is affecting every sector of the economy. Through developments such as e-commerce, robotics and automation it is also constraining the labor market and dampening wage growth. Employment tasks most susceptible to automation are those that are highly structured, predictable and repetitive. These tasks are most prevalent in sectors such as hotel and food services, manufacturing, transportation and retail. New jobs will emerge and the occupations that change will outnumber the ones that are automated away. Still, there will be a great deal of dislocation, as the new jobs may arise only after a considerable lag. These new jobs will often require distinct skill sets and be located in different cities. One puzzling feature is that as technological innovation has accelerated, productivity growth has plummeted. We show that this is at least partly due to the mismeasurement of quality improvements, the exclusion from official statistics of “free” digital services, and underinvestment in IT by physical industries. Further, technological advances have dampened inflationary pressures and flattened the Phillips curve. This presents a challenge for central bankers who remain overreliant on Keynesian models and place insufficient weight on the macro effects of disruptive technologies. Regardless, over the coming quarters we believe most major central banks will raise policy rates, but will do so cautiously and gradually, at a much slower pace than has historically been the case. Given this, we expect that nominal bond yields will rise only moderately, which should allow equity multiples to remain elevated. Epoch has always favored companies with a demonstrated ability to produce free cash flow and allocate capital effectively, believing they are the most probable winners. These attributes are likely to be even more important going forward, as management is tasked with creating value by marshalling talent and technologies during a period of unprecedented innovation and disruption. The impact of disruptive technologies has been one of our key investment themes for quite a while and last month we examined its implications for corporate finance in a paper, “Tech is the New Macro: Impacting All Three Components of Return on Equity.” Rather than ROE, this companion note focuses on the theme’s implications for the macro outlook, particularly employment and wage growth, as well as inflation and productivity. One key takeaway from this piece is that investors should place less emphasis on the Keynesian perspective that has been dominant for decades. The mainstream Keynesian approach stresses the role of economic slack on inflation in prices and wages, relying heavily on the Phillips curve, and actively promoting the use of monetary and fiscal policy to manage the business cycle. Most central bankers and macro forecasters remain steeped in this tradition, in spite of its lack of empirical support over the past two decades. Rather than a Keynesian approach, we advocate a more Schumpeterian view of the economy, one that highlights technological change, innovation and firm creation. This perspective focuses less on countercyclical policy and more on structural efforts to encourage innovation and equally important, to mitigate the costs of labor dislocations. The latter is particularly important, as we believe the structural headwinds buffeting the labor market are likely to become more pronounced in coming years. Our previous note showed that technology has led to higher returns on capital, including dramatically improved profit margins and better ROEs. While this is great for investors, the flip side is a shrinking proportion of the economic pie accrued to workers. This has placed the U.S. labor market under stress and resulted in a number of adverse developments, including lower participation by prime-age males (Figure 1). Additionally, technology has been associated with a dampening of wage growth, the loss of jobs in a number of sectors and increased income inequality. Each of these developments will be discussed in some detail below, but first we provide two examples of how technological developments are affecting the labor market. Since GDI is the sum of all income earned while producing goods and services it is more appropriate for this ratio than GDP, which focuses on expenditures. Developments in the retail sector provide a good case study regarding the implications of technology for employment and wages. E-commerce has been around for a while, but its impact has been most profound since August 1998 when Amazon announced plans to move beyond books (apparently with the intent to “sell everything to everybody”). In recent years, online retail sales have been growing by a solid 15% per year, which is roughly four times the growth rate for traditional brick-and-mortar retailers. Despite faster sales growth, the share of retail employees who work for internet retailers has barely budged. This is reflected in a much lower employment-to-sales ratio, a trend which shows no signs of reversing (Figure 2). To the contrary, by dramatically reducing transaction costs, e-commerce has captured 65% of all retail sales growth over the past two years (with Amazon alone capturing 60-70% of that). This process will likely continue to put downward pressure on both wages and employment in the retail sector. Source: Epoch Investment Partners, Bloomberg. Indexed to 100 at 1/1992. Our second example of how technology is shrinking the labor share concerns robotics. According to the Boston Consulting Group (BCG), the number of industrial robots will grow by 10% per year over the next decade (versus the historical growth rate of 2% or 3%), driving a surge in the global installed base from 1.7 million in 2014 to between 4.5 and 6.0 million by 2025.1 This jump is being driven by the double whammy of declining costs (the prices of hardware and enabling software are projected to drop by more than 20% by 2025) and improving performance (5% per year is forecasted). The gains in efficiency are expected to follow from advances in cloud-computing, vision sensors, gripping systems, and other innovations that are making robots smarter, more agile and increasingly networked. With these developments, the share of tasks in manufacturing industries that are performed by robots is set to increase from a global average of around 10% today to about 25% by 2025. To make the discussion a bit more concrete, observe the increasingly favorable economics of spot welding robots in the U.S. auto industry. The total cost of purchasing and deploying a robotics system plunged from an average of $182k in 2005 to $133k in 2015 and is expected to fall another 22% by 2025 (Figure 3). To illustrate the unequivocal decision facing automakers, a human welder today earns about $25 per hour (including benefits), while the equivalent cost per hour for a robot is around $8 (when amortized over five years), and could plunge to as low as $2 by 2030. Over the next decade the savings in labor costs will provide a substantial tailwind for the profits and margins of manufacturers. For example, BCG expects such costs in the U.S. to be 18% to 25% lower by 2025. Further, recent academic research concludes that “One more robot per thousand workers reduces the employment to population ratio by about 0.18–0.34 ppts and wages by 0.25%–0.50%.”2 This will most definitely move the needle over the coming years and help drive healthier margins for companies that are able to use such technologies. The flip side though, and similar to the case with e-commerce, is that developments in robotics will remain a major headwind for labor markets in the U.S. and in other developed economies. WHICH EMPLOYMENT TASKS ARE MOST LIKELY TO BE AUTOMATED? The acceleration of robotics, e-commerce, and other technologies will undoubtedly affect employment trends across a host of occupations. To illustrate how pervasive and disruptive this could be, a 2017 study by McKinsey found that 60% of occupations in the U.S. have at least 30% of constituent activities that could be automated using currently available technology.3 This is certainly worrisome, but the good news is that they estimate less than 5% of all occupations can be automated entirely. McKinsey concluded that the workplace activities most susceptible to automation involve physical activities in highly structured and predictable environments, as well as the collection and processing of data. That is, tasks that are highly repetitive, whether they are manual or cognitive in nature, appear most susceptible to automation. As Figure 4 illustrates, such tasks are most prevalent in sectors such as hotel and food services, manufacturing, transportation and retail. On the other hand, pre-K and elementary school teachers, as well as those employed in professional and IT sectors have much less to fear from the rise of the robots. Figures 5 and 6 also show that the jobs of lower income and less educated workers are most at risk to technology. Unfortunately this implies that income inequality, already an enormous challenge, is set to worsen over coming years. It also suggests an important role for public policy to mitigate the negative consequences of labor dislocations. Such policies should encourage retraining and mobility, and may require more aggressive anti-trust action and amendments to the tax code (for example, with negative income tax credits). It is also important to emphasize that the estimates reported in Figure 4 are gross rather than net forecasts, in that they do not take into account all of the new occupations that will undoubtedly emerge. Although there will be a great deal of dislocation — as the new jobs may only arise after a considerable lag, and will likely require distinct skill sets and often be located in different cities — the historical experience is quite clear. New jobs will emerge and more occupations will change than will be automated away. Source: White House, Council of Economic Advisors, “Artificial Intelligence, Automation and the Economy”, 2016. Some technology-specialists, like Martin Ford (author of “Rise of the Robots”), paint a pessimistic picture of the future, in which a sizeable proportion of the labor force is permanently supplanted by robots and become perpetually unemployed. While the pessimists, most of whom are techie-types, argue that this time is different and machines really will take a large fraction of jobs, most economists and historians maintain a more optimistic view. They note that tech-driven innovation is not particularly new (even as they concede that the process is accelerating) and that with time, in spite of all the fear mongering, technology always creates more jobs than it destroys. Professor Robert Gordon of Northwestern University takes this view even further, arguing that there is nothing truly different about the new wave of technology, which in many ways is less disruptive than the steam engine and electricity were in their day. The uncomfortable reality is that no one can really predict how this will play out with any confidence, not even of the experts surveyed by the University of Chicago (Figure 7). Indeed, the truth may well lie somewhere in between the optimistic and pessimistic perspectives. New technologies such as A.I. may not cause mass unemployment, but could speed up existing trends, turbo-charge automation, and lead to uncomfortable levels of labor market disruption. Additionally, though short-term job losses are likely to be more than offset by longer-term job creation, the historical experience shows that the transition can be traumatic (long lags, new skills required, different locations). Consequently, just about everyone agrees that these changes will be highly disruptive and that public policy can play a meaningful role. The good news is that the overall benefits from robotics and A.I. will almost certainly outweigh the costs, making it possible to compensate those negatively affected (Figure 8). In a 2015 article, “Toil and Technology,” Professor Bessen of Boston University predicts a “difficult transition” rather than a “sharp break with history.” Although some types of jobs may be displaced by technology, many more will evolve. For example, he notes that a construction worker who is expert with a shovel but cannot drive an excavator will generally experience falling wages. Similarly, a bank teller who can tally currency but cannot provide “relationship banking” is unlikely to fare well. His primary conclusion is that workers are more likely to benefit if they supply tasks that are complemented by technology and automation, but not if they primarily supply tasks that are substituted. This presents a momentous challenge for workers and employers, as well as educators and public policy makers. However, the policy makers seem much too focused on trade and do not appear to have given sufficient thought to the implications of new technologies. TRADE VS. TECH: WHICH HAS THE BIGGER IMPACT? We agree with Professor Tyson’s assessment, as do most other researchers. For example, a recent study out of Ball State University concluded that almost 87% of U.S. job losses in manufacturing from 2000 to 2010 can be attributable to productivity improvements (that is, technology), with the remainder due to trade (note though that the proportion attributable to trade was much higher in certain sectors, such as apparel and furniture). Further, research from Robert Lawrence of Harvard University examining manufacturing employment from 1987 to 2011 has suggested similar proportions. Additionally, in its April 2017 World Economic Outlook, the IMF examined the decline in labor’s share of national income in developed markets over the past three decades.4 The IMF concluded that about 50% of the decline is due to the impact of technology, with globalization contributing about 25%. The remaining proportion was either attributed to changes in policy and institutions (e.g., tax changes, labor market policies or unionization) or categorized as unexplained. A number of studies have also reminded us that it is often difficult in practice to cleanly separate the impact into distinct buckets labeled trade or technology. For example, one cheeky commentator noted that the most important technology displacing American workers has been the container ship. One of the most puzzling developments over the past decade is that, even as technological innovation has accelerated, productivity growth has plummeted (Figure 9). We think a significant portion of this decline is illusory and has occurred because official statistics are understating the impact of new technologies and the digital economy. More specifically, we believe U.S. productivity growth is currently being understated by 50–100 bps per year and could well accelerate over coming years. To provide the rationale behind this view, we now briefly discuss three issues: the mismeasurement of quality improvements (e.g., for services like health care or for goods in the IT sector); the growing importance of items that are not counted in GDP statistics (the many “free” services such as search engines which increase consumer welfare but do not involve a monetary transaction); and the large and growing gap in productivity between digital and physical industries. To begin with the growing issue of quality adjustments, it is important to recall that the national accounts framework that is used to calculate GDP and productivity was first developed in the 1930s and 1940s. Since then, the way we measure the economy has evolved, but the structure of the economy has changed even more quickly. In particular, the digital revolution has turbo-charged product innovation, led to rapid quality improvements which are often not properly accounted for and wind-assisted the shift from a goods-centric to a service-centric economy. Regarding the latter, Martin Feldstein of Harvard University has argued that, despite all the improvements to statistical methods, measurement problems have become increasingly difficult as the share of services rises.5 As Figure 10 shows, services have risen from about 40% of personal consumption expenditures in 1951 to about 68% now, while the goods share declined from 60% to 32%. It is much easier to measure the quality and quantity of things you can drop on your toe than it is for many services (with health care being particularly tricky). To illustrate how economic statistics have not kept up with the digital revolution, a number of researchers have documented the extent to which official prices do not fully adjust for the quality improvement in high-tech products. Of particular note is a recent study by David Byrne of the Federal Reserve Board and two co-authors. They found that, when correctly adjusted, high-tech prices fell on average 15.7% a year over from 2004 to 2015, more than twice the 7.3% in official price reports.6 This is important because correctly adjusting high-tech prices has a dramatic effect on the sector’s productivity (Figure 11) and also boosts the economy’s overall productivity growth rate by about 25 basis points per year. Further, this demonstrates that innovation in the tech sector has been much stronger than official statistics show, which the authors highlight may presage a second wave of productivity across the broader economy. This is consistent with the historical record which suggests that new technologies boost productivity, but typically with a significant lag. A second serious flaw with the national accounts upon which productivity and GDP growth metrics are based is that they exclude free digital content and don’t take into account the time savings associated with new technologies, such as internet searches. Regarding the latter, Hal Varian, Google’s justly famous chief economist, reckons search generates $500 of consumer surplus per user annually, or $150 billion nationally for the U.S. More broadly, two researchers from MIT valued the time people spend on the internet to estimate the associated consumer surplus, which they valued at $564 billion in 2011, or $2,600 per user. Had this surplus been included in GDP it would have raised economic growth by 0.4 ppts on average. Reflecting the increasing share of consumption that is made up of digital products delivered at a zero price, there is now a burgeoning strand of research that looks beyond the current scope of GDP, making the case that economic welfare has improved much more rapidly than have official measures of productivity. This seems eminently reasonable, with most approaches suggesting that accounting for zero price activity could add about one-half of a percentage point to the average annual growth rate of the U.S. economy over the past decade. The deeper problem though is that GDP is designed to be a measure of market-based activity, not of human welfare or consumer surplus. However, this measurement gap is now growing so quickly that Adair Turner (until recently chairman of the U.K.’s Financial Services Authority) recently asked, “Is productivity growth becoming irrelevant?”7 He posited that measured GDP and gains in human welfare eventually may become entirely divorced. Although we are far from there yet, the trend in that direction may well help explain the recent productivity slowdown. The above discussion highlighted two of the measurement issues associated with GDP. However, equally important is the large and growing gap between sectors where the output is primarily digital (tech, content, finance, and professional and technical services) and the physical industries (such as manufacturing, construction, mining, wholesale and retail trade, utilities, healthcare, hotels, restaurants and transportation). In “The Coming Productivity Boom,” Mandel and Swanson note that the digital industries account for 70% of all private sector investments in IT, even though they represent only 25% of employment.8 As Figure 12 shows, this contrasts sharply with the physical industries, which account for 75% of employment, but make just 30% of the investments in information technology. A key consequence of this large and growing IT investment gap is shown in Figure 13. That is, productivity growth in the digital industries has averaged an impressive 2.7% over the last 15 years. However, productivity in the physical industries rose by just 0.7% annually, leading to anemic growth for the overall economy. Several commentators have argued that this “information gap” is a key source of recent economic stagnation and the so-called productivity paradox. Three-quarters of the private sector — the physical economy — is operating well below its potential, lagging in IT investment and not taking advantage of rapid technological advances. Mandel and Swanson conclude that a catch-up transformation could boost annual economic growth by 0.7 percentage points over the next 15 years. We would be delighted if this optimistic projection proved correct, but nothing in Figures 12 or 13 suggests such a boom is imminent. Having discussed the implications for employment, wages and productivity, we now explain how technological advances, acting through a number of channels, have dampened inflationary pressures and flattened the Philipps curve. As can be seen in Figure 14, during the past two decades core goods prices in the U.S. have increased by only 0.1% per year on average (and this is likely an overestimate due to inadequate adjustment for quality improvements). On the other hand, core services prices have risen by much more, reflecting a lack of productivity growth and likely a fair dollop of mismeasurement (especially in sectors like health care and communication). However, services prices are to a significant extent driven by domestic wage inflation, which faces headwinds from technology and automation. This helps explain why, even with the unemployment rate close to its fifteen year low, wage growth is not accelerating and services price inflation is below its historical average. This is not to suggest that inflation will never again be problematic, but that its procyclical nature has been dramatically reduced and that its future peaks are likely to be well below what we have experienced historically. Mainstream economists typically use some version of the Phillips curve to measure the relationship between inflation (either of wages or consumer prices) and economic slack. Historically, the slope of the Phillips curve has been roughly 1.25, implying that a 1 ppt decline in the unemployment rate tended to increase wage growth by 1.25%. However, more recently, the slope has declined to about 0.35 today (Figure 15). This suggests that cyclical inflationary forces are still at work, but they are only one-third to one-quarter as powerful as they were in previous decades. Additionally, one can see that the standard error of residuals is large, especially in relation to the low level of inflation. This means the noise-signal ratio is disturbingly high, which presents a challenge for policy makers who try to exploit this very loose relationship to hit their policy targets. GENERALS FIGHTING THE LAST WAR: WHAT DOES THIS MEAN FOR CENTRAL BANKERS? For a start, the above discussion strongly implies that central bankers should have less confidence in their models and ability to fine-tune the dual objectives of low inflation and maximum growth than they have exhibited historically. As highlighted at the beginning of this note, we believe the evidence overwhelmingly suggests less emphasis should be placed on the Keynesian perspective that has been dominant for decades. Rather, we think greater attention should be given to a more Schumpeterian view of the economy, one that emphasizes technological change, innovation and firm creation. This perspective focuses less on short-term cyclical dynamics and more on structural changes, such as that represented by technological innovation. This shift in central bank thinking is occurring, but so far only along the edges. For example, the Bank of Canada has “Created a new digital economy team that focuses on how automation is unfolding and affecting the economy [and] are reviewing the measurement issues that are exacerbated by the proliferation of digital and services-oriented technologies.”9 Still, we expect that over coming years this type of analysis by central banks will shift from the periphery to the core of what they do. This is particularly important, as we expect the structural headwinds buffeting the labor market are likely to become even more pronounced in coming years. What then does all this mean for central bank policy over coming quarters? For the major central banks that have communicated a tightening bias, we believe they have plenty of time to act and will be able to raise rates cautiously and gradually. Central Banks will likely hike rates at a much slower pace than they did in previous cycles and in most cases, by less than they have already signaled to the market. The impact of disruptive technologies has been one of our key investment themes for quite a while now. Last month we examined its implications for corporate finance and showed that technology is likely positive for all three return on equity (ROE) components — profit margins, asset utilization, and leverage. Further, this capital-light environment will allow many companies to increase dividends and buybacks, keeping overall payout ratios high relative to historical norms. This companion note focused on the implications for the macro outlook. We believe technology will continue to constrain the labor market and suppress wage growth. We also show that technological advances have dampened inflationary pressures and flattened the Phillips curve. One implication is that, although we expect most major central banks will tighten policy over coming quarters, we believe they will be able to do so at a much slower pace than has historically been the case. Given this, we expect that nominal bond yields will rise only moderately, which should allow equity multiples to remain elevated. Additionally, it is crucial to keep in mind that disruptive innovation will affect all economic sectors, not just information technology. As a result, it is more important to favor companies with a demonstrated ability to produce free cash flow and allocate that cash flow wisely between return of capital options and reinvestment/acquisition opportunities. Epoch has always favored such companies, believing they are the most probable winners. These attributes are likely to be more important going forward as management is tasked with creating value during a period of unprecedented innovation and disruption. Boston Consulting Group, “The Robotics Revolution: The Next Great Leap in Manufacturing,” 2015. Acemoglu, D. and P. Restrepo, “Robots and Jobs: Evidence from U.S. Labor Markets,” Working Paper (MIT and BU), 2017. McKinsey Global Institute, “A Future that Works: Automation, Employment and Productivity,” 2017.
International Monetary Fund, “Understanding the Downward Trend in Labor Income,” World Economic Outlook (chapter 3), 2017. Feldstein, Martin, “Underestimating the Real Growth of GDP, Personal Income, and Productivity,” Journal of Economic Perspectives, 2017. Byrne, David, et al, “Prices of High-Tech Products, Mismeasurement, and Pace of Innovation,” American Enterprise Institute, 2017. Turner, Adair, “ Is Productivity Growth Becoming Irrelevant?” Project Syndicate, 2017. Mandel, Michael and Swanson, Bret, “The Coming Productivity Boom,” 2017. Wilkins, Carolyn, “Blame it on the Machines,” Bank of Canada, 2017. Autor, D. “Why Are There Still So Many Jobs? The History & Future of Workplace Automation,” Journal of Economics Perspectives, 2015.